Bead embroidery is typically done in layers. 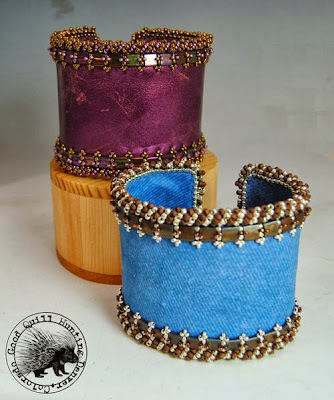 In the case of a cuff, more often those layers consist of the beadwork stitched on leather, an inner core of brass, and an under layer of suede. These are then glued together and finished with decorative edge stitching. This process gives body to the cuff while also hiding and protecting the back of the beadwork. 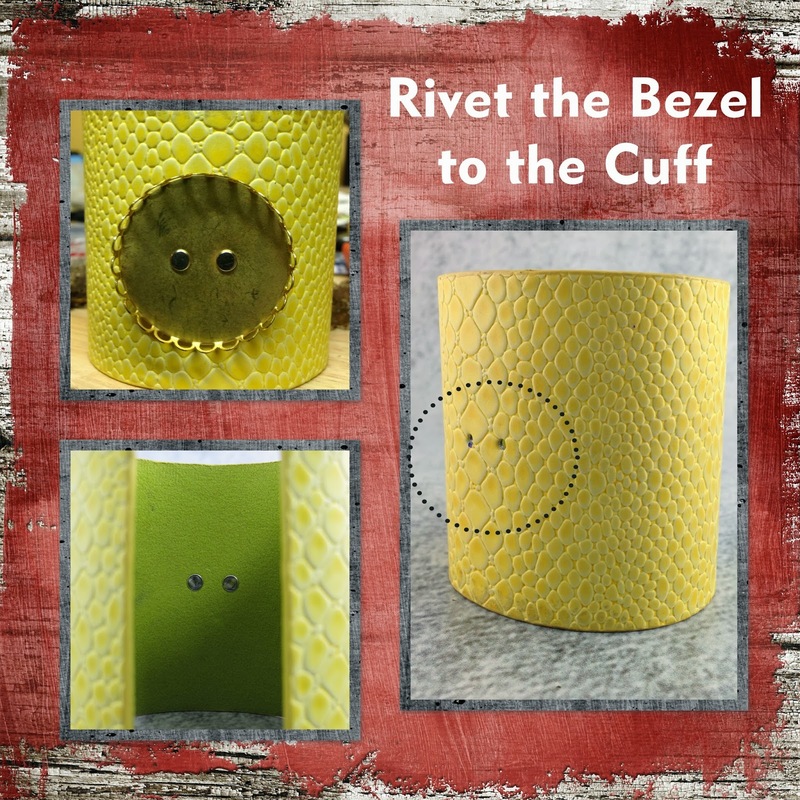 But what do you do when you have a finished cuff? 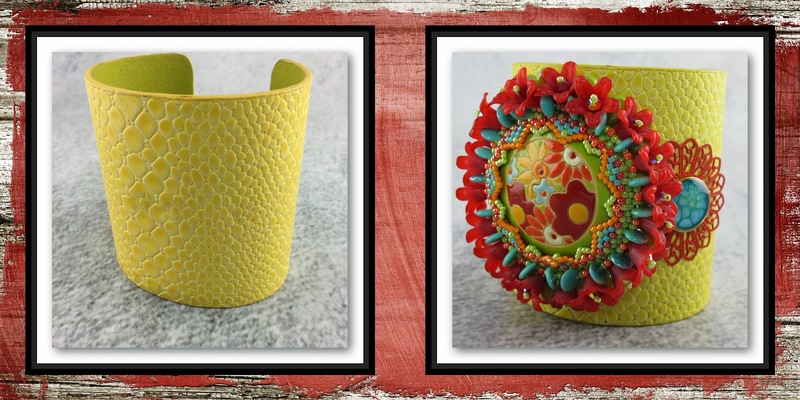 How do you get from a plain but finished cuff to one embellished with bead embroidery. You could do the beadwork separately and then glue it to the cuff. 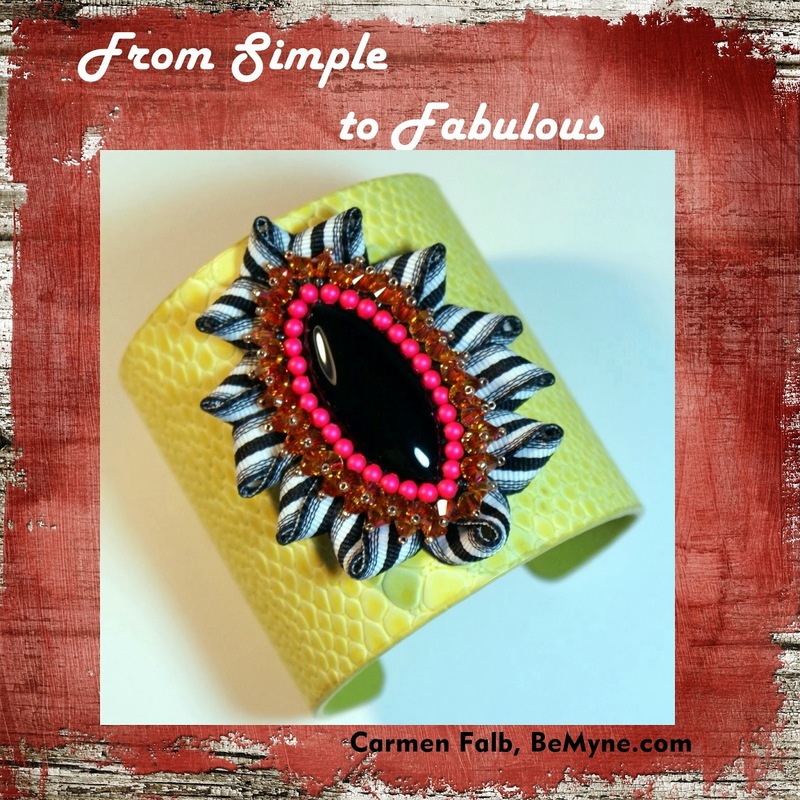 Carmen Falb, designer and owner of BeMyne, took a different approach using the same yellow cuff I'm using for this demonstration. Carmen is a friend and a gifted beadwork designer, she is also my go to person when it comes to glues. Since an early age, I've been glue challenged and either can't get it to stick or I get it everywhere including all over me. I'm working to overcome my glue phobia but it still gives me fits, probably due to a lack of patience. Carmen stitched her beadwork to a foundation of Lacy's Stiff Stuff (a beading foundation). She then attached it to the cuff using an epoxy glue. Her cuff is an excellent example of why glue has been used to great effect in jewelry making for decades. Given my glue handicap, I've been working on a series of projects that use a standard lace edged bezel as the foundation for not only the cabochon, but also the first row of beadwork.The only limitation is the size and shape of your cabochon in comparison to the size bezels that are available. You'll find a wide variety on Etsy, the ones I used in this project are from TheCraftyStore. I also use the bezels from Nunn Design for my smaller cabochons. The first step is a scary one, you have to punch holes in both the bezel AND your cuff. You need two holes to prevent the bezel from moving. Mark carefully and center the bezel on the cuff. Eurotool's power punch is my preferred punch for this type of project. You can find it at most jewelry tool retailers. 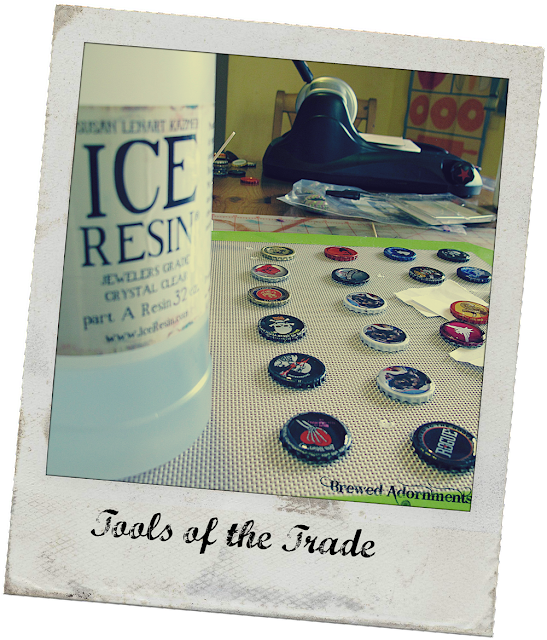 StampingBlanks.com carries this tool and a 1/16 die that allows you to use the smaller rivets on the market. You can use a wide variety of rivets, including making your own from wire. 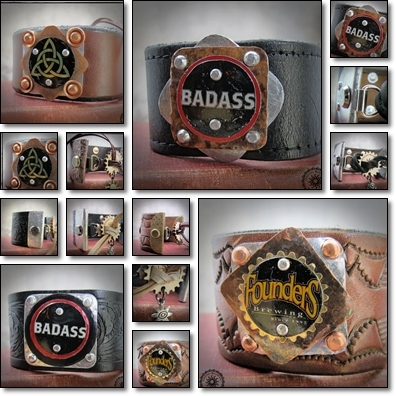 In this project I used snap rivets from TandyLeather. The type of rivet is not important, just make sure it's neatly done on the back and that it is a flush as possible inside the bezel. Using fireline, anchor your thread to one of the spokes the add two beads and carry the thread to the next spoke and repeat. With this first step, I typically use size 11 beads but it depends on the depth and diameter of your bezel. You'll need to experiment. Continue around the bezel, adding two beads on each spoke, making sure that the beads stay on the outside of the bezel. Pass through the first set of beads added. At this point you'll pick up one or two beads and pass through the next two beads. You want to close the gaps between the beads while maintaing an even count. When you reach the beginning, go through all the beads again and tie off. Place your cabochon in the bezel and gently push the bezel spokes onto the cabochon being careful not to damage it or the beads. At this point the bezel secures the cabochon the beading is merely decorative and you can add as much or as little beading as you like. In this example, I did several rows of peyote to completely cover the metal bezel and to frame the cabochon nicely. This cuff is large at 2 inches and the cabochon is equally large at 45mm. Because of this, it doesn't set flush on the cuff necessitating at least one row of fringe to hide the gap between the bezel and the cuff. 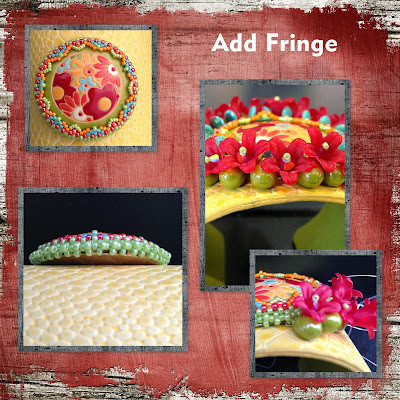 Again, the options are endless in how much and what types of fringe to add. Large drops, daggers, and crystal are just a few of the choices available to you. 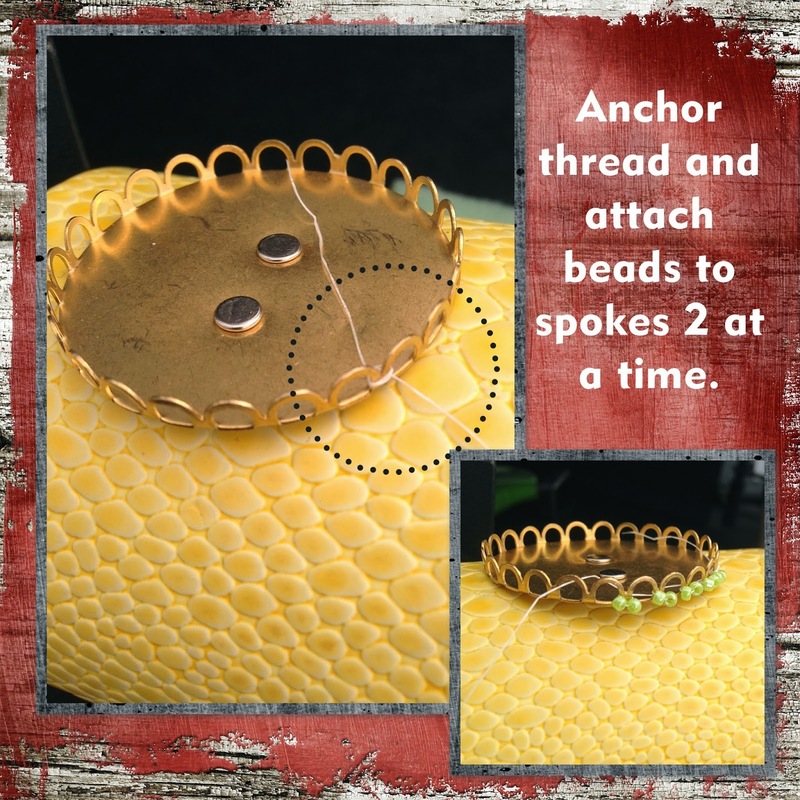 Finish by anchoring your thread in the beadwork. For my example, I used a cabochon from Golem Studios. There are two layers of fringe, large glass drops on the first layer from Pam's Bead Garden. Lucite flowers from The Hole Bead Shoppe and Swarovski crystal bicones were used on the second layer. When I finished the beadwork, I felt the cuff was somewhat out of balance and needed some additional embellishment. Filigrees from Ezel Findings were added to each side along with screw in bezels from Nunn Design to which I added Prisme Fantasy paints and resin. The resulting cuff is an amazing transformation from it's humble beginnings. I was fortunate to purchase a couple of cuffs from Christina Neit of Good Quill Hunting. My intention was to embellish them using the same method I've discussed here. However, the beauty of the leather she used really demands a different treatment, something simplier that allows the edge treatment to take center stage. 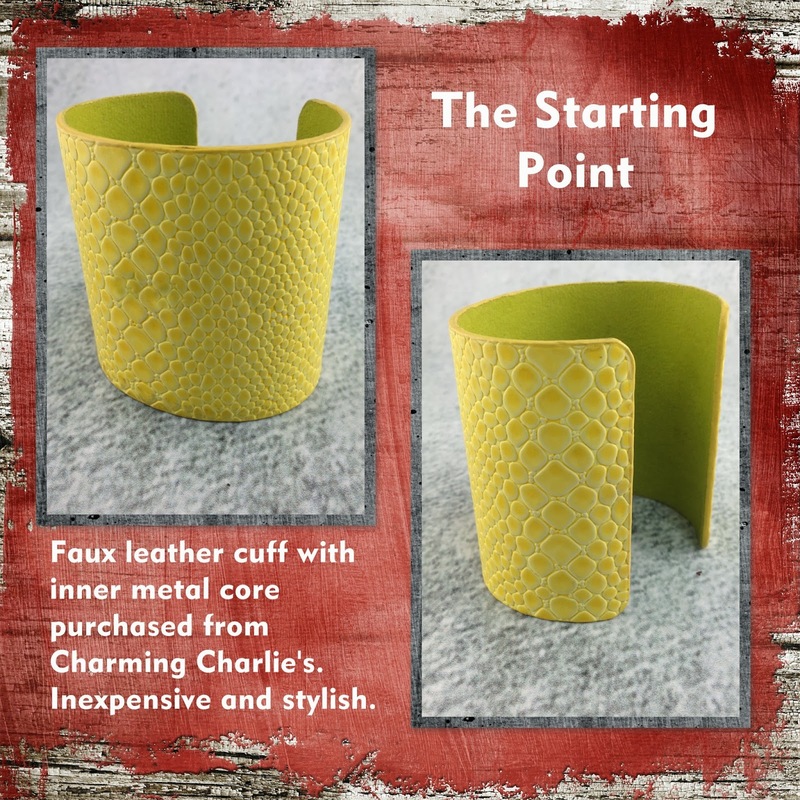 Christina has a tutorial on her website that shows you had to recreate these cuffs. For now, I enjoy wearing them, but I like having the option to combine a bit of my artistry with Christina's, whose beadwork I greatly admire. The possibilities are endless with this technique and I've enjoyed experimenting with different bezels and different shapes. And when I have a bezel without the lace edge, well that hole punch comes in handy and I created my own. 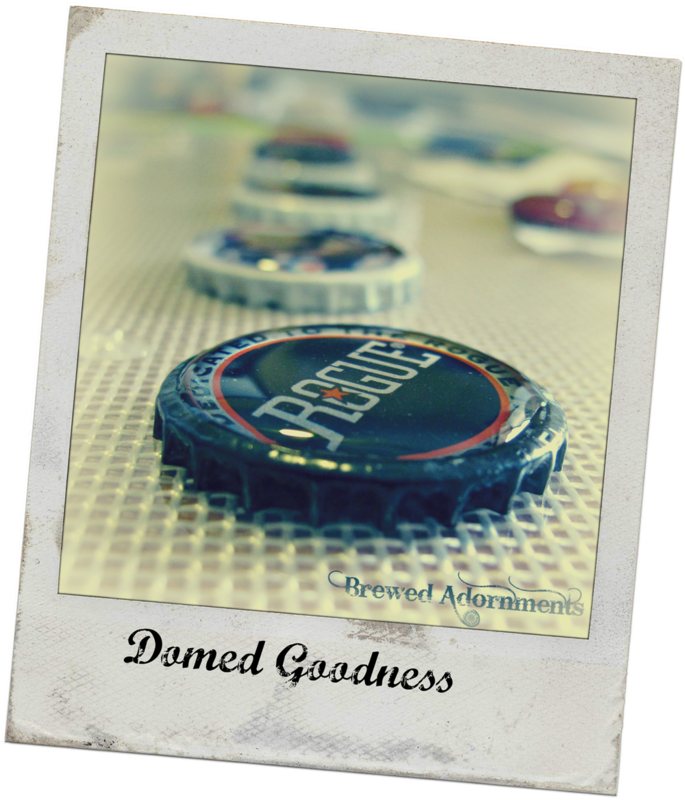 This technique is fabulous when working with domed bottle caps. It allows me to protect the back, add a bit of weight and gives a more solid surface for attaching the bottle cap to foundation. 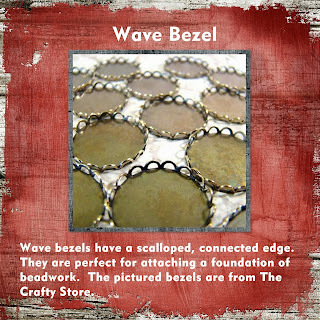 Here are just a few of the pieces I've created using bezels. I am a student of natural and earth sciences as well as religions, history, archeology and anthropology. The making, wearing, meanings and uses of beads seem, for me, to focus all of those interests into a single point. I incorporate what I have learned from my studies into my glass beads to give them purpose. My intention is that the colors, shapes and designs should have a meaning over and above being a handcrafted work of art. In my opinion, beads should be as much a symbol of belief, authority, rank and power as they may also be a representation of nature and a work of art. It all started simply enough; a friend's kitchen, a pile of beads and a new passion was born. 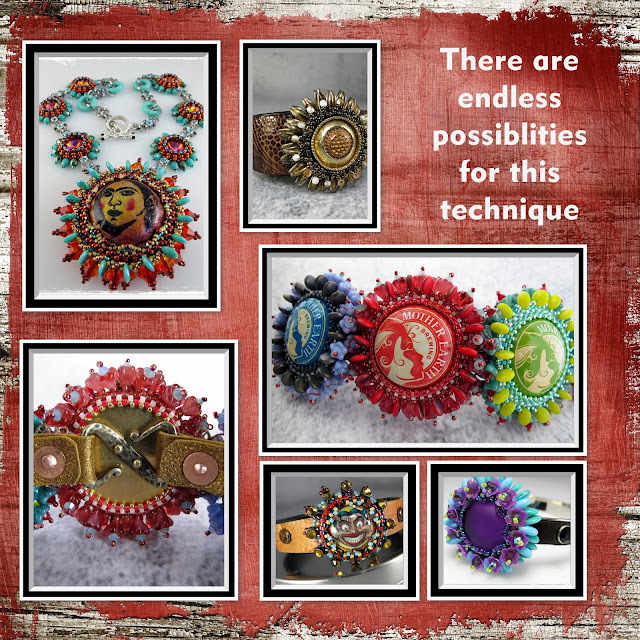 Brewed Adornments blossomed from that fledgling start into a focus on recycled and repurposed jewelry design. 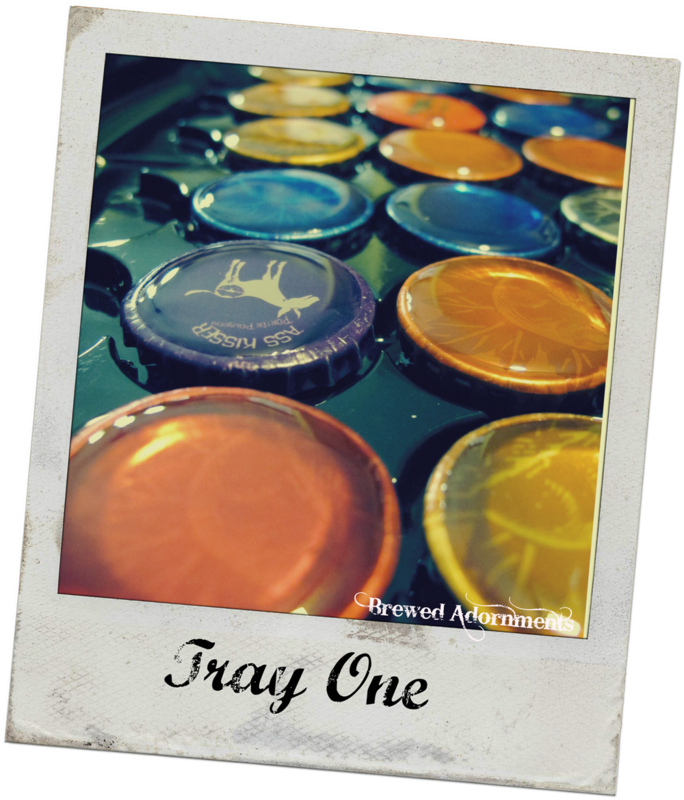 Bottle caps quickly became my muse and I'm honored to add my artistry to that of the unsung graphic designer behind the logos. My work is evenly divided between beadweaving and metalwork and I enjoy mixing the two design elements together. I draw my inspiration from the objects and colors around me and often incorporate artwork and components from the artists I've met along the way. Collaborations such as this one often lead me in new, unforseen directions. In this piece, we provide a glimpse of winter in an industrial city like Detroit; beautiful but grimy, hard edges and raw power, a raw uncut diamond and a dangerous yet elegant opponent. Hardware mixes with the luscious color of champagne pixie dust beads while the sparkle of steel slowly transitions to the inevitable tarnish of bronze. Industry and winter ebbs and flows through the city, yet it a lasting beauty endures. Detroit, like most major cities, has a rich sports history so it's no wonder a Detroit-themed challenge would contain a few sports related elements. Hockey epitomes the tarnished city both in elegance and brutality. This hockey themed piece parellel's the winter theme of my Synergy entry in that all three are diamonds glittering below the surface. All three are beautiful; the shear grace of the players as they maneuver, their unrestrained joy as the puck reaches it's target, the equal joy when a goaltender thwarts a goal, all of it at amazing speed on thin little blades of steel. Yet what player can boast a full set of teeth in a sport that celebrates the battle and quietly applauds the enforcer's punch. Detroit, despite its detractors and the corruption that is its downfall, has contributed greatly to the rich fabric of our lives through industry, the arts, struggle, and lessons of tolerance. Initially, I planed the two designs to mirror one another in construction. Sheldon's elegant beads required a different approach and the result is a wonderful blend of refinement and industry. 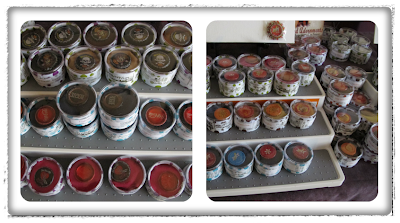 How to display the prepared cabochons was the day's dilemma. purchase the whole pack for a discount. pendant choices both in cap and colorway. on cards to help the buyer. So much to say and so little time! I'll skip the rest for the moment and go straight to the important news. 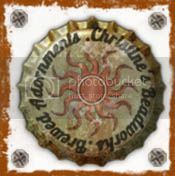 Cat Ivins, (shop owner and artisan of Polarity and Uncorked), has sponsored a giveaway for me. I've enjoyed Cat's blog, Olive Bites, for sometime now. It's a perfect balance of instruction, news, and humor with a generous splattering of great finds. There is still time to enter the drawing for a CUSTOM belt cuff with your choice of bottle cap. So head on over to Olive Bites for some fun reading, you'll be glad you did. As I edited my background and headers this evening, I looked at some of my past posts and was amazed at how long it had been since my last posting. At that time I was busily working on updating my business presence and much of my time was taken away from my blog. I have a lot to catch up with but I'll leave you with a few teaser pictures while I gather my thoughts. It's important for an artist to sign his/her creations. The artist signature or mark identifies it for all time and is often the final step in the creative process. Something about applying that signature or mark closes a creative verse and leaves a sense of well being with the artist. Jewelry artists have struggled to find a way to apply their mark to the artwork. 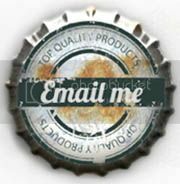 For metal artists that often involves a stamp that is hammered into their piece or attached as a separate tag. Bead woven jewelry still does not easily lend itself to an artist's mark and again most of this work is left unsigned or tags are attached that don't often remain with the work. Why should you care? Ultimately the mark is there for the future. Beadwork encompasses a huge body of work that has lasted for centuries and has had historical significance. Time will tell if patterns emerge and whether we can trace an artist's growth and influences through the years. At the very least, your mark will be important to your buyers and/or your family for future generations. Bead embroidery artists have learned from quilters and embroidery artists and many have begun finding small ways to mark their creations. Since most of this type of work has a fabric backing of some sort, there are places the artist can write or embroider their initials. It's this type of beadwork signature I'm currently exploring. In this post I concentrate on my first steps in branding my designs. Cat Ivins hosts a series of giveaways on her blog Olivebites. 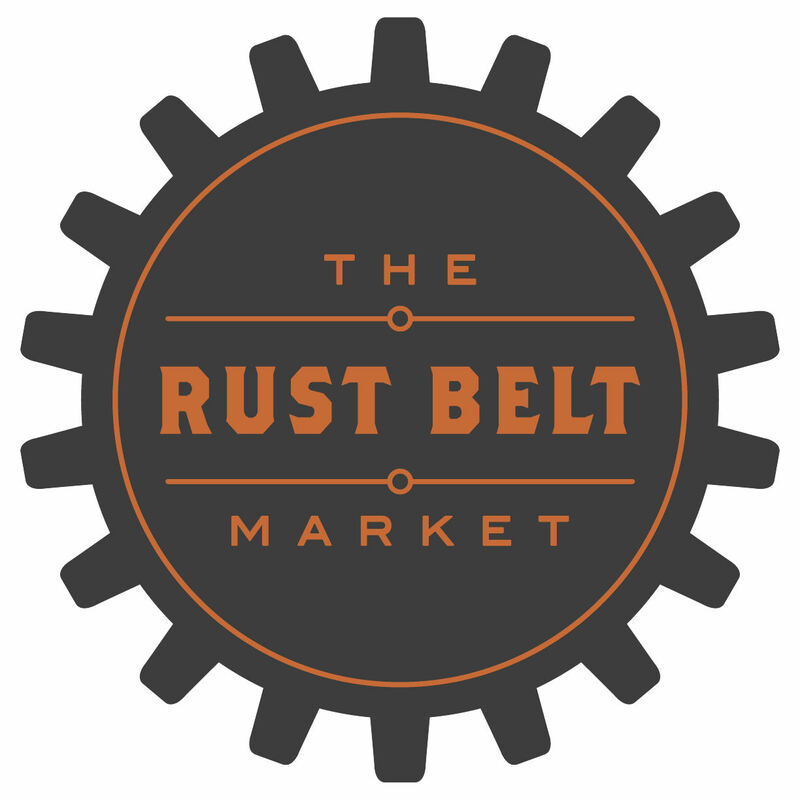 It was there that I discovered Bullfrog Laserworks, and owner Roberto Sand. He was giving away a custom stamp, so off to his shop I went. I was astounded at what I saw. I had been looking for awhile at having a custom stamp made for cards and packaging, and Roberto's are not only functional, they are beautiful. These well made stamps have wooden handles engraved to match your design and can be made in practically any size and shape you need. I ordered two stamps. The larger one will serve as my Thank You on boxes and cards but I can also cover the words and just stamp the larger logo when needed. 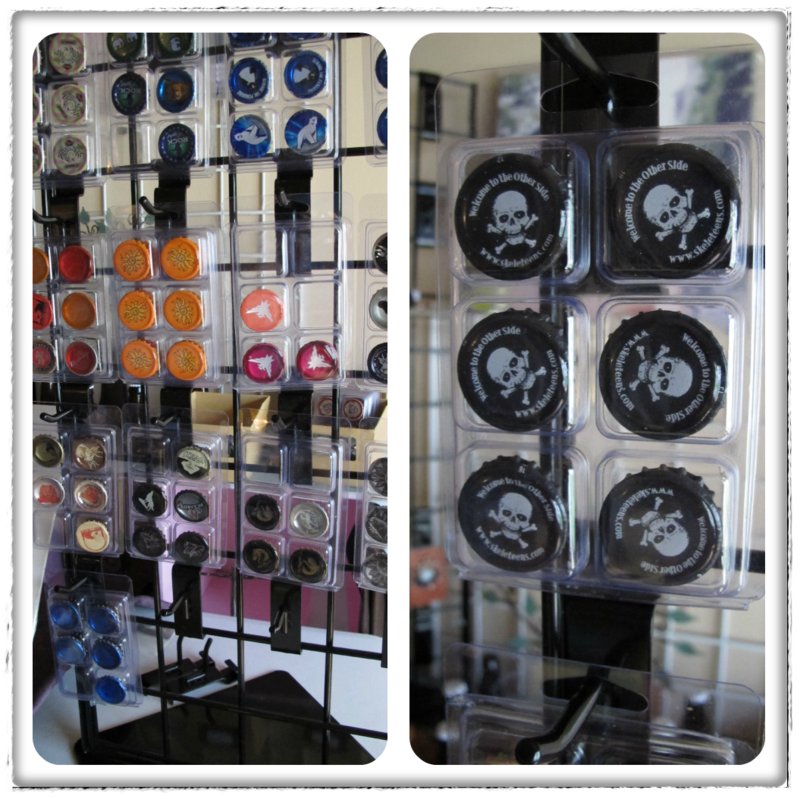 The smaller logo was purchased with the intent to mark my ultra-suede, metal work, and the tops of plain bottlecaps to use in packaging. These stamps are wonderful, but they weren't the most amazing item I found in his shop. The second item is still in the prototype stage, but we're getting close. Roberto has wooden tags he initially designed as wedding favors. The slots in these tags caught my eye because I had been looking for slotted buttons (also called ribbon slides) to use on my laced back cuffs. Because of the small size of the button (7/8") the slots are not centered to allow room for the text. Roberto is sending me a sample so I can see if it rests properly on the cuff, if it doesn't we'll go back to using two holes for the ultrasuede to hook through. I'll be able to color these buttons and perhaps put artwork on the reverse side. I'm looking forward to playing with them and seeing where else they can be used and how I can alter them to coordinate with my design. But wait, there's more! 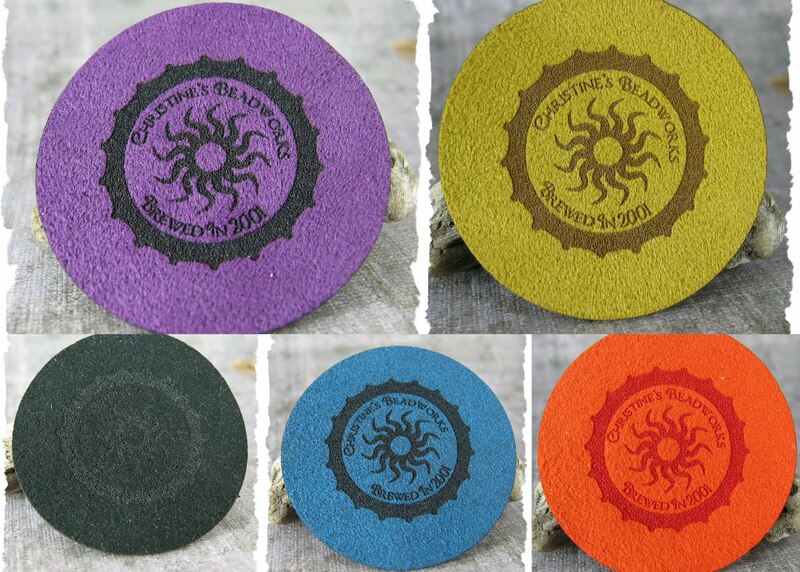 As excited as I was about these discoveries, I was nearly jumping out of my chair when I saw his listing for 50 faux suede labels custom engraved! 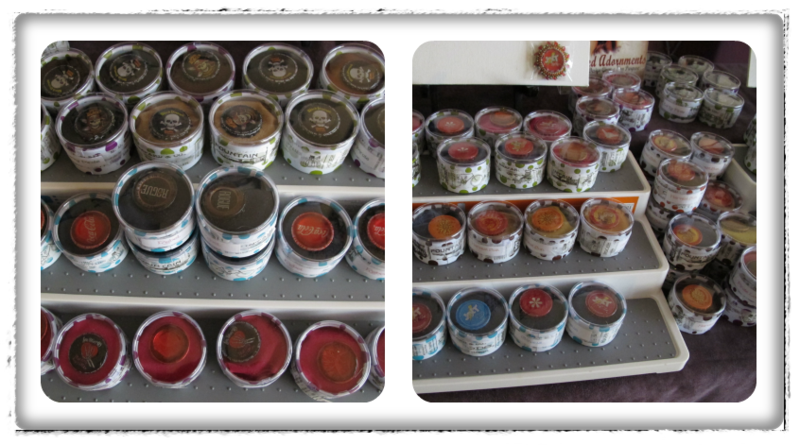 We began a long exploratory journey into faux suede while I considered the most practical use of these amazing labels. I knew it would be too expensive for me to have multiple shapes cut, so I settled on a large circle with my logo at approximately 25mm in the middle. This would fit the majority of the cabochon pendants I make. The faux suede Roberto offers in his shop is not ultrasuede, it's a polyester blend that frays. This is not the end of the world, when the laser cuts out your shape it seals the edges. For me, though, that would require pieces to match the size of all my cabochons, I wanted more flexibility. I asked if I could send him some ultrasuede to use and was delighted when he agreed. We were both thrilled with the results although I did discover that light to medium colors work best. As you can see, the logo did not show up well on the black and I loved the tone on tone result on the Orange ultra suede. I quickly worked up a couple of Izze pendants and couldn't be happier with the look. 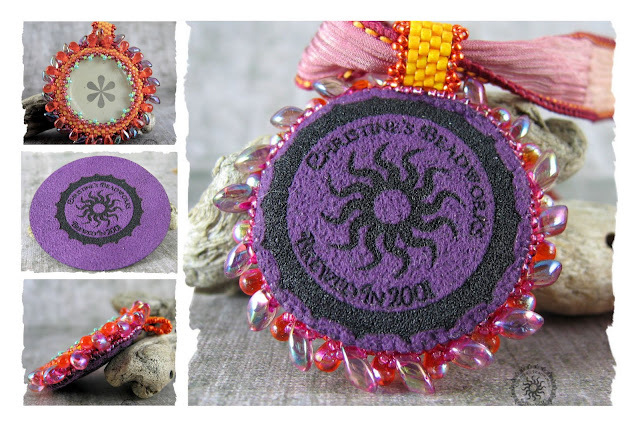 They add a professional touch while also keeping to the whimsy I like in my beaded work. 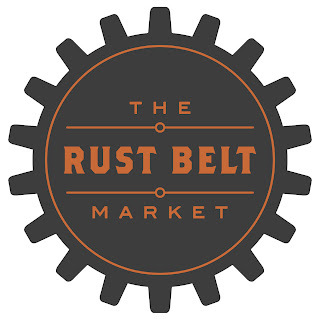 I'm looking forward to incorporating the stamps on my metalwork and anticipate a more industrial feel if what I envision works out as planned. So now what to do for my cuffs? Since these are made in various widths, it just wasn't practical to laser engrave them. My first experiment was with heat embossing. I was at one time addicted to HGTV. The first step to recovery is admitting you have a problem. My realization came when my daughter (then only 2) exclaimed "it's Joan" when the host of one of my favorite shows came on the air. I learned about heat embossing velvet from Carol Duvall a longtime host of all things crafts. I thought I'd try to see if it worked on ultrasuede. It will be hard to see in this picture, but it works amazingly well. I set the iron at the "wool" setting, placed the stamp image side up and layered the ultrasuede on top. I held the iron on the ultrasuede for 10-20 seconds, pressing firmly. I lifted carefully and repeated until I could begin to see the indentation of the stamp. It worked beautifully. It's much more subtle than the laser engraving, but it still marks effectively. Unfortunately, I did not get the same results with my new stamps. The handles made it hard to get a firm press, I'd have to have them mounted on a flat wood block instead. But the biggest reason is the detail. My logo is too detailed for this method. You need a stamp with deeper impressions, something to consider when you have your stamp cut. My last experiment for this post was using the stamps and Staz-on ink. The image to the left is the larger logo and the one on the right is the smaller one. Both work well and this is the method I'll use for my cuffs. With the smaller stamp, I'll need to press very firmly to work the ink into the grain of the ultrasuede. I did these quickly and got good results, taking time and experimenting with ink colors will yield even better results. I like the boldness of the laser cut images, but these are a great alternative.